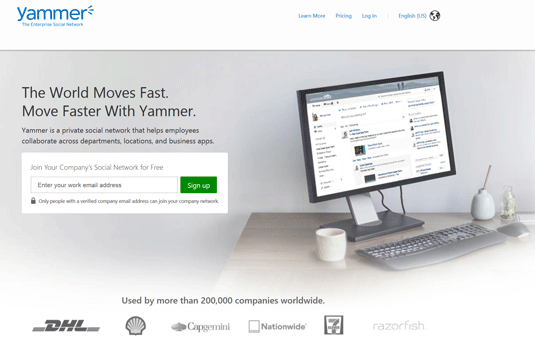 Point your browser to Yammer.com to sign up for your free account. You will see a Sign up field prompting you for your email address. Your email address will let you connect only with others with the same domain name. For example, if your work email is me@iworkhere.com, you will only be able to see others with email addresses ending in @iworkhere.com. Enter your business or school email address and click Sign up. 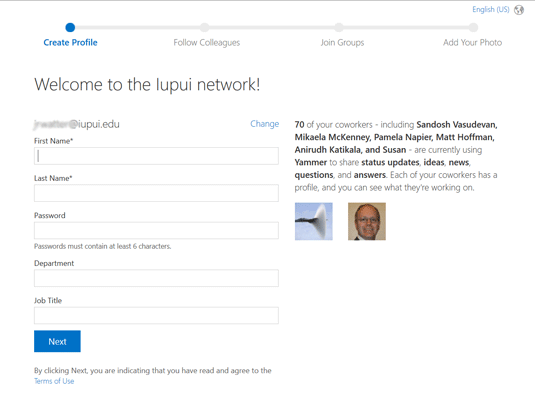 Yammer will identify your network and take you to the Create Profile page. Enter your name, password, department, and job title. This information makes it easier for others to identify you and connect with you. When finished, click the blue Next button. You will be taken to the Follow Colleagues page. Enter the names of colleagues or coworkers that you want to follow. Choose a few people to follow to get started. This is a good way to begin growing your network. Remember, if coworkers are on different domains, you will not be able to find them. When finished, click the blue Next button. You will see the Join Groups page. Select any groups you want to join. Based on the information you have entered thus far, Yammer makes recommendations on groups it feels you might want to join. 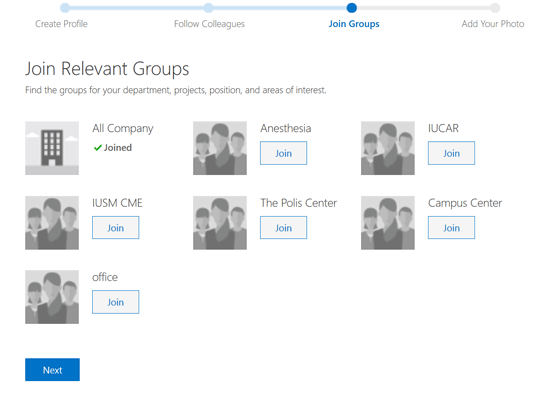 Choose any groups you want to be a part of and click the blue Next button. You will be taken to your final step: the Add Your Photo page. Choose a photo to add as your Profile picture. After you have chosen a Profile picture, click the blue Save & Continue button. Congratulations! You’re ready to get started on Yammer. 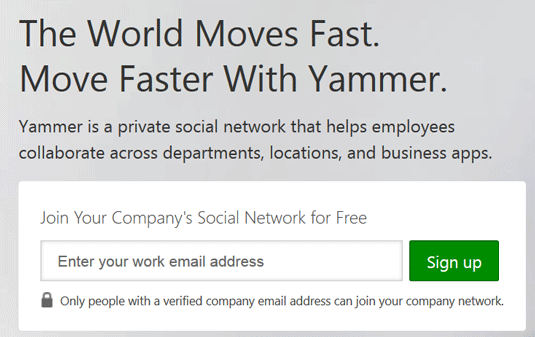 You will automatically be taken to the Yammer home page where you will see the Feed for your network.